Today’s roster update for MLB The Show 18 is notable for developments related to the two most highly-touted rookies this season. Making his debut in MLB The Show is Atlanta Braves outfielder Ronald Acuna Jr. while Shohei Ohtani will now be playable in a different way. After last week’s update was the first to introduce ratings changes none have been made this week. Acuna has been given a base roster rating of 78 Overall with ‘A’ Potential for Franchise Mode. In Diamond Dynasty he’s rated 76 Overall and is now the third most pricey player to acquire on the Braves. Acuna has only played in 8 games so far, making it a small sample size, but he’s hitting .382 with 2 HR and 5 RBI. 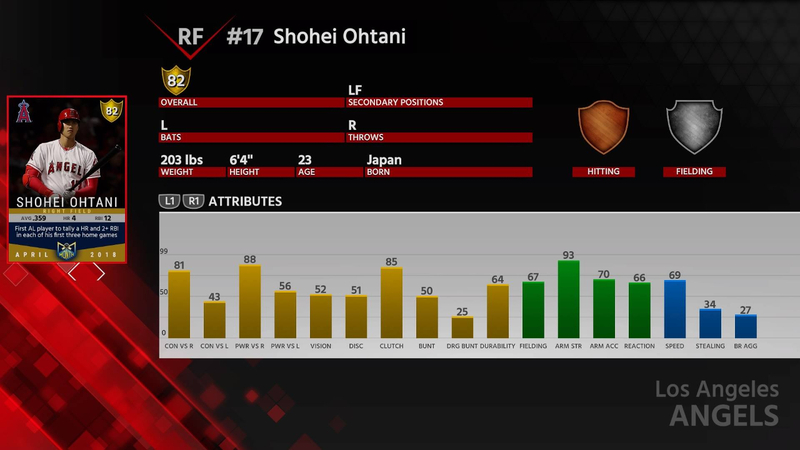 In other MLB The Show 18 content-related news the first position-player card for Ohtani has been introduced to Diamond Dynasty. With a primary position of right field and secondary of left field, Ohtani is rated 82 Overall with 81 Contact vs Righties and 88 Power vs Righties. Those are higher than his hitting stats from his starting pitcher card. Ohtani has only been available in the game as a pitcher (currently 78 in DD) who could in theory be inserted in the lineup only as a pinch hitter. In DD he would at least get at bats when pitching due to the lack the DH in the mode. This new card will find him ineffective if moved to the pitching mound so it’s not the dual-Ohtani everyone has hoped for since the game released.